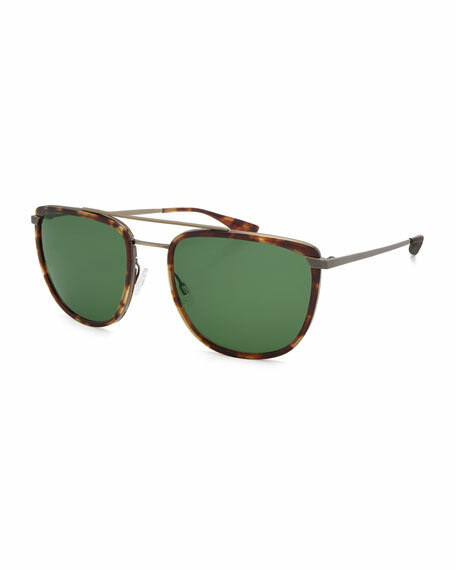 Barton Perreira "Lafayette" rectangular navigator sunglasses. Zyl® acetate and metal frames. Revolutionary technology, unsurpassed craftsmanship, and ingenious design have made Barton Perreira sunglasses sought-after accents. Cofounders Patty Perreira and Bill Barton focus on custom-designed colors, and each frame in the line is handmade in limited quantities. For in-store inquiries, use sku #2188757.